In the spirit of other blog sites, especially the Management Carnival, I thought I would share some links to a few blogs that found very interesting over the last month or so. I hope you enjoy them. A Tough Obituary to Write by Bill Waddell – This is a different perspective on the passing of Steve Jobs. This is a point of view I had thought about writing but Bill beat me to the punch and I didn’t want to redo something he had written so well. Building Your Personal Value Proposition by Bill Barnett – A great post about understanding yourself and what you are interested in. Use that knowledge to know where you fit in a company and build your personal value. Encourage Talent If You Want It To Grow by Steve Roesler – Steve hits on some great points to help grow talent through encouragement. Even when you feel an employee is doing what they should be doing it is good to encourage them. Building Manager Standard Work by Jamie Flinchbaugh – This blog will link to his full article at Industry Week. Don’t but a process in place for something that already has a process like check email every day at lunch. Planning On Not Knowing by David Kasprzak – We won’t always know what do to next but that shouldn’t stop us from planning. Plan in spots to review and determine what to do next. Manufacturing Skills Gap or Management Skills Gap by John Hunter – If the people don’t have the manufacturing skills they need is that their fault? Or do we have a gap in our management skills? Assembly Mag Thinks Whirlpool is Lean. Really. by Kevin Meyer – This is about Whirlpool and the fake lean. It hit home because I grew up in Evansville and watch the decline of Whirpool. This weekend I went by one of our many local McDonald’s restaurants. It has been newly renovated. It looks really nice, but there was on thing that caught my eye. The new drive-thru setup. The ordering and pay/pickup windows are the same. The change was in the parking spaces. After the remodel McDonald’s added two parking spaces with reserved signs for people in the drive-thru. I wish I was able to get a picture of the spots but my camera phone was not working. The spaces are there because orders aren’t ready so they ask the customer to pull up and park. They will bring the food out when it is ready. So are the spaces a good idea? Or bad idea? I think the spaces are a good idea if they are tracking how many people have to pull up and wait. If they use it as a way to highlight a problem. Cars in the parking spaces = problem. This is equivalent to something we do in our manufacturing plants. When there is a problem we divert the work to a penalty area to understand the problem and fix it. This way it does not interfere with the flow of the work that does not have a problem. But, we are gathering data and looking at and understanding process problems to resolve. The other thought is to not have the parking spaces and to have the car sit and block the line until the problem is fixed. This is a reasonable solution also, but I would use it in one of two circumstances. 1) The time to fix the problem is very short and wouldn’t hold up the line for very long or 2) if the restaurant does not use the parking spaces as a way to highlight the problems and work on fixing the process so zero cars have to pull over. Even Toyota, when they stop the line only stop a portion of the line and not the entire line. If it is a big problem, Toyota will still move the car offline to a visible area to work on resolving the process problem that created the situation. We must understand our process well enough to understand which option for highlighting our problems might be best. What are other ways to highlight problems? Today is Black Friday in the U.S. It is the day after Thanksgiving and the largest shopping day of the year. Every retailer will have great sales and deals to lure people into their store. While this may be fun for some people who enjoy bargain shopping and getting a great deal, it is a day that everyone seems to lose respect for other people around them. There will be stories of people being trampled as doors open to stores where crowds have been waiting outside. People will shove, bump, slam into and elbow other people to hurry to get to a item before the store runs out of that particular deal. It truly is amazing to me how everyone forgets common courtesy and manners. If you were in a work place that showed this little respect for people you would quit in a heartbeat and not even think about it. I understand that not everyone is like that on Black Friday but the number grows exponentially. In fact, there are news stories every single year about some crazy incident that happened. So, if you are a Black Friday shopper please remember how to respect others as you shop. Tomorrow is Thanksgiving Day. A great day to watch football, eat a large amount of food and enjoy the company of family and friends. I want to say a special thank to all the readers of my blog. I appreciate your comments and your time. I know your time is valuable and knowing you take a few minutes each week to read what I have posted means a lot. I hope to continue to add value and post topics and viewpoints that you enjoy reading. In a heavy machining manufacturing environment, there are two lean concepts that I believe need to be done very well to have sustained success…Total Productive Maintenance (TPM) and Quick Changeover (SMED). Some may say continuous flow is the most important concept. The issue is flow can not happen if the machines are down unexpectedly or if the changeovers are taking a long time. If a machine goes down, then flow stops all together or WIP is built up between the processes so when the machine goes down unexpectedly the following process does not go down also. The longer a changeover takes the more WIP needs to be built up in front of the next process. In either case, this causes the flow to be interrupted. Any WIP that is introduced between the process interrupts the flow of that particular item even when things are running smoothly. The item has to stop and wait will the items in queue in front of it go through the process first. This can make it difficult to link processes together to create the smooth flow. Yet, these are two tools that I rarely see as a high priority to master in a manufacturing environment. 5S seems to be the tool to try and master first and then standard work. I do believe these are extremely valuable and necessary concepts, but if you don’t implement them trying to solve a particular business need then sustaining the gains is hard. 5S and standardized work can both be implemented through a TPM and SMED program. 5S can be used so tools are in their place and ready to go when a changeover is taking place or maintenance is being done so the machine is down for less time and production can start back up. There should be standardized work to make sure the TPM is happening. Checklists is a common way to have standardized work for TPM. There should also be standardized work for changing over a machine in the quickest, safest, most efficient manner that is known. All the concepts are important. I see TPM and SMED as two concepts that are vehicles to other concepts introduction and success. Are there other areas TPM and SMED are as important? Maybe with IT systems? Layouts Diagrams – Material handling or movement. A spaghetti diagram with instructions works well. Picture Diagrams – Assembly of complicated components. A great example is LEGO instructions. The format (digital or hardcopy) and size of the paper are up to the people doing the work. Just be consistent once a decision is made. Remember, it isn’t how the standardized work instruction looks. It is about getting everyone to agree to execute something in a standardized way. When this is done an issue can be spotted quickly when the standardized way isn’t followed allowing for an improvement opportunity. My daughter has been a member of the Girl Scouts for 4 years now (2 as a Daisy and 2 as a Brownie). Being November it is that time of year. We are out in the neighborhood selling Girl Scout Cookies. While as a father, I can’t say I’m always excited to go door-to-door selling things but the Girl Scout troupe my daughter is a part of does some great things for the girls. This year I have noticed a big change in my daughter. Normally she is a very quite and shy person. Last year when we sold cookies I would have to practically pull her out from behind me to talk to the people and I ended up doing most of the speaking. This year is a huge change. She does almost all the talking and I stand at the bottom of the steps while she is at the door. She has come out of her shell and is more forward. It has been a long journey to help her come out of shell. Giving her a huge safe learning zone has been part of the key. The Girl Scouts do that for her. Also, when we are at Fast Food restaurants we have her go up and ask for refills or condiments without us being there. When she does we make a big deal out of it. Over time this has given her confidence and it is starting to really show during the door-to-door sales this year. As managers and leaders, we have to help our employees come out of their shell or safe zone and into the learning zone. When we do that our employees will gain more and more confidence. The more confidence they gain the better results and more creative problem solving will occur. Giving adults as well as children a safe and big learning zone helps them to gain confidence in what they are doing. It is our job to help give them a safe learning zone. As for my daughter, I can’t wait to see how this translates to the basketball court this winter! The company where I work uses the phrase, “Throw out old files” to mean something other than throwing away old papers. The phrase is used to refer to eliminating perceptions of others we may have from past dealings with them. How many times have you worked with someone that didn’t work out well? The person may have been difficult to accept new ideas or rude in meetings. Whatever the case, you have perceptions about this person and now you don’t look forward to working with them. A second phrase jumps out, “Self fulfilling prophecy.” If a person goes into a working relationship with thoughts of not wanting to work with another person and it will be troublesome, it usually ends up troublesome. To combat this, people should try to “throw out old files” they have on a person. Start new and give the person a chance. The person may behave in the same manner as you have seen in the past, but giving them a chance gives everyone a chance to succeed. Many times people do behave differently. Maybe circumstances outside of work have changed for the person or circumstances at work, putting them in a better state of mind. Throwing out old files is not an easy thing to do. Especially, if the person keeps behaving in the same manner over and over again. But you may be surprised as to how many people you can get a long with and even become friends with once old files are thrown out. Professor James Barany passed away earlier this week. A lot of people probably won’t know Prof. Barany, but if you passed through the Industrial Engineering School at Purdue University you did. Professor Barany has been at Purdue since 1956 when he entered the graduate program. Once he graduated he stayed on as part of the faculty and has been there ever since. He influenced me as an undergraduate student as well as many others, including some of my mentors. He wasn’t just recognized by Purdue. Prof. Barany was internationally know. As a researcher, Dr. Barany gained international recognition for his studies of hemiplegic gait using a force platform of his original design, fabrication, and validation. That was that. I ended up taking an advanced human factors course instead. I will never forget the conversation. 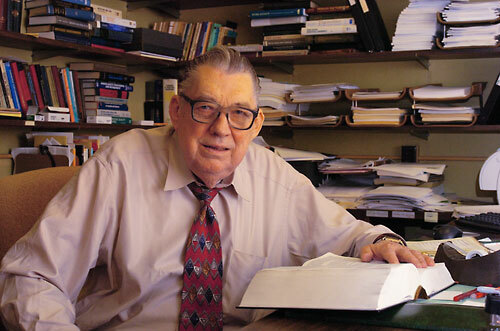 Professor Barany was a great man that influenced all Industrial Engineers at Purdue since the 1950s. It was a sad day at Purdue. Thanks for everything Professor Barany. I came across a great story showing how a restaurant’s thinking is about the customer first leading to repeat customers and more profit. Here is a link to the story. I would recommend taking 2 minutes to watch the video of the story. It is well worth it. Passing along increased food prices just upsets customers. I know I have quit going to a few restaurants because the same meal was now $2 more. Multiple that by a family of four and over time that gets very expensive. The hidden way a restaurant passes on increased cost is by keeping the price the same but giving the customer smaller portions. Either way this is an example of Price = Profit Wanted + Cost. This restaurant (Avenue’s Bistro) is trying not to pass on the increased food prices to its customers. Instead they are trying to hold their prices steady with a unique strategy. No. The restaurant doesn’t buy lower quality food. Instead, they look for high quality food that is less expensive and can still hit the menu price points their customers come to expect. The manager talks about giving value to the customers. Understanding the customers want quality dining experience for a good price. The customer wants a good meal with generous portions at a reasonable price. Changing the menu based on what food they can get within their cost range also gives the customer different options of food to try on a regular basis. They seem to be focusing on the model of Profit = Price – Cost. The restaurant may not be lean but there seems to be some lean like thinking going on and focusing on the customers is a great practice. Have you seen any restaurants that seem to be using lean like thinking?